September 10, 2015 Emily V.
If you open any fashion/beauty magazine or online article they will tell you all of the beauty essentials you shouldn't leave home without. Those items will no doubt come in handy when you get that last minute text to go to happy hour but are they going to help you during a non-fashion situation? Probably not. 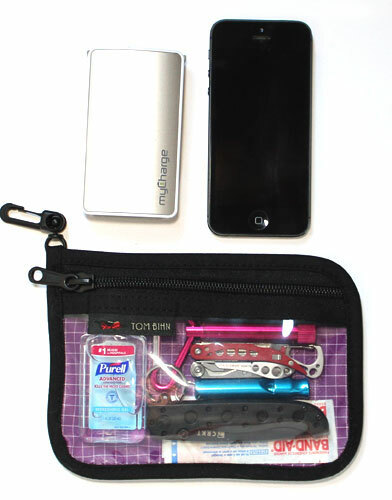 I want to talk about my basic mini essential purse kit. Now, I'm not talking about emergency kits or prepper bags, I'm talking about some tools to have on hand, tools that you may not use daily or weekly but if you do need them you'll be glad you had them. Keep in mind this shouldn't be mistaken for a survival kit, get home bag, bug out bag, or emergency kit. Ideally, you want to have one of those bigger bags for situations that can sustain you for period of time (more posts on those in the future). But there's nothing wrong with having a basic kit in your purse. You never know when these little items might come in handy. My daily purse is my Proenza Schouler 'PS1' Medium Satchel. 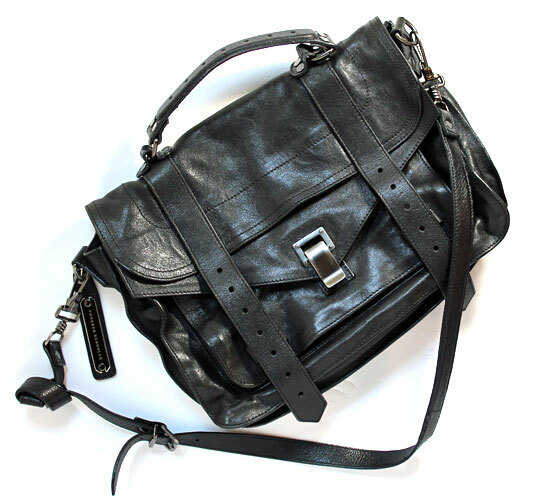 I love this bag with its many compartments and vary carrying ability (hand, shoulder, arm, and crossbody). This is the main bag that I use after work, on the weekends when I'm running all around, and sometimes when I'm heading out for dinner & drinks. 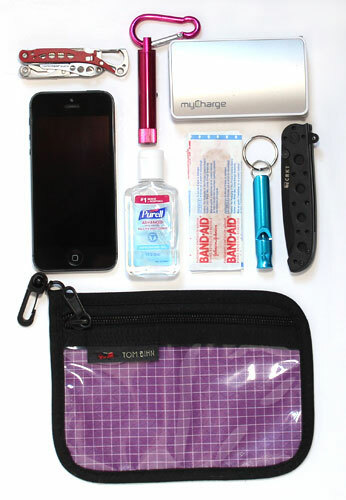 The actual pouch that my purse kit contents are organized in is the small clear organizer pouch by Tom Bihn. I recently found these and let me say I'm loving them. They are durable, super lightweight, and the clear front panel is perfect for allowing to see all my items. Leatherman Style PS Multi-tool: You've probably seen some version of this in your Father/Husband/Boyfriend's possession and there's a reason for that. A multi-tool can cover a lot of ground and you gives some options in case you need them. Band-Aids: I never really used to carry band-aids with me until one day I needed one and didn't have one. For me, they come in handy for the unexpected blister. I can wear the same shoes over and over with no issues and then one day they oddly give me a blister. Cash (not pictured): It's always a good idea to have a little cash handy. If you're like me then you never have cash on you. And if you’re in a situation that you might need to hop in cab, pay for public transportation, or pick up food or essentials having some cash on hand that is reserved for only these types of situations will be a lifesaver. I can think of a few occasions where having this stash came in handy when I needed to grab a cab quickly. It was a simple situation where it started pouring rain and I didn't have an umbrella #SaveTheShoes. And a harsher situation when I was walking home and felt uneasy due a suspicious man I thought might have been following me. Mini Flashlight: Besides the obvious of helping you to see in the dark, a flashlight can also be used to signal for distress. Using the Morse Code SOS pattern is a great way to signal for help using a flash light. If you are unfamiliar with this pattern it's basically three short bursts of light, three longer bursts of light, and then three short bursts of light. This video shows you how send the Morse Code S.O.S signal via flashlight. Purell Anti-Bacterial Gel: This is pretty obvious, right? I try not to think about all of the germs we encounter every day because it really freaks me out. So I always have hand sanitizer with me. I've even used it to wipe things off as well by squeezing a small amount onto a tissue and then wiping down whatever I needed to disinfect. Whistle: A whistle is such a small item and often overlooked when you think about what essentials you want to carry, especially in your purse. It's great to signal for help, alert others to your location, and possibly scare off someone before a potential dangerous situation. Crkt 3" M16-10KZ Folding Pocket Knife: You might be thinking 'Why do I need to carry a separate knife when the multi-tool has one?' Great question. The main observation would be that it is substantially bigger and stronger. If carrying a pocket knife is new to you, it might seem a bit strange at first but it really isn't. You would be surprised at how many people carry one. In the tactical/prepper world it's often referred to as your 'EDC' (Every Day Carry). The knife is great for cutting through something that the multi-tool can't handle, first-aid such as cutting through bandages, and as a weapon/self-defense. While it's not the best option for a weapon it's better than nothing. 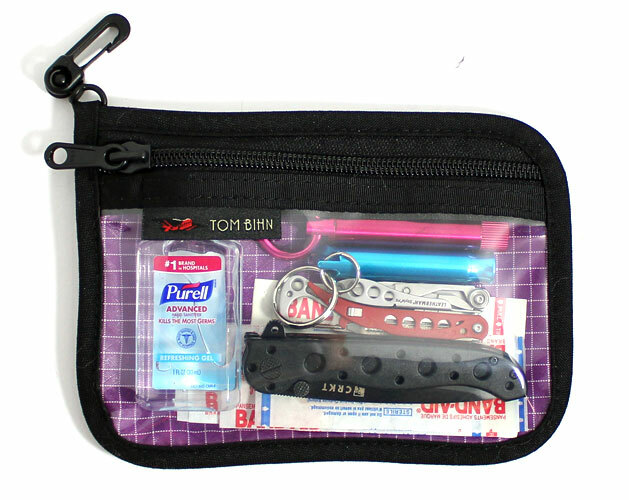 And yes, it's not going to help you in a self-defense situation if you have to first dig it out of your purse and then out of the pouch so the best option would be to take it out and clip it to your pocket or coat. If I'm walking by myself at night or through a sketchy area, I take it and carry in my hand and in my pocket so I'm ready. Phone: You're probably thinking #duh right about now but it's not why you think. Yes, the phone is your lifeline to the outside world, not for posting your latest selfie, but for that emergency call/text and also don't forget it has a built in flash light. You might be wondering why I carry a separate mini-flashlight if you can just use your phone? For me, the flashlight on my phone is my back-up. I want to save battery life on my phone for any emergency/calls or texts that I need to make so I don't want the flashlight eating that juice. Portable Phone Battery Charger: I'm pretty good about keeping my phone plugged in to charge during the day. However, more often than not, I realize that my phone is low on juice when I'm heading out for a few hours. If you're stuck in a sticky situation where you may need to use that built in flash light or need to talk to emergency responders, you are going to want to make sure you've got some extra power handy. 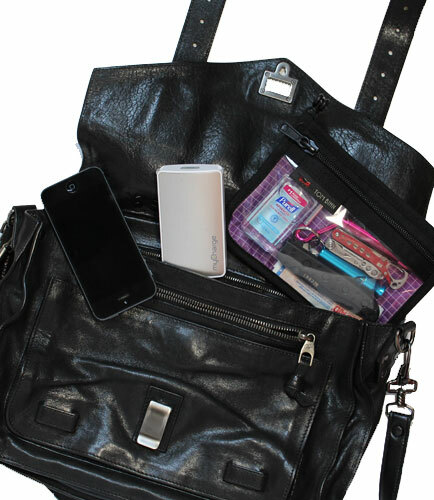 One the great things about having a purse kit contained in one pouch is that you can easily grab the pouch and transfer it to other handbags or totes. Which is something I do on the regular. It's even small enough to fit into my size small Chanel Boy Bag. 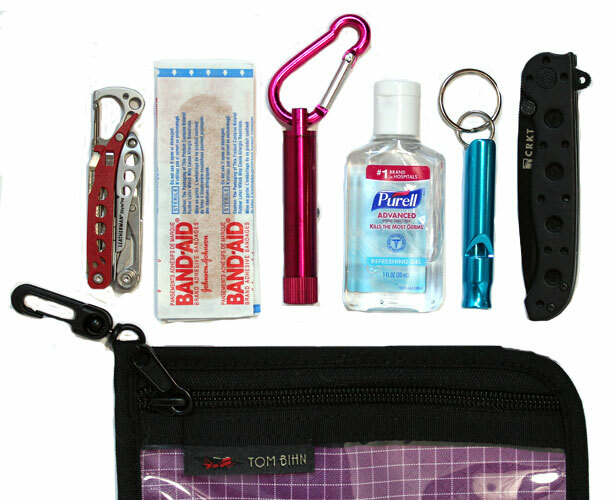 Do you have a purse kit you carry in your bag? If so, I'd love to know what items you are carrying. Is there a must have that I'm missing? Disclosure: The information provided is based on my opinions and for informational use only. I am not an expert in this field and any items listed here should be used at your own discretion and in accordance with the manufacturer’s instructions. You can read more about my privacy & disclosure policies here.